Empyrean Weapons are a series of powerful high-damage and low-delay weapons that can be upgraded with the AF3 Upgrade Moogle. The base weapons drop from Abyssea Notorious Monsters, It's up to you to unleash their full potential. These weapons require items dropped from Notorious Monsters in Abyssea zones, as well as Tanzanite Jewels which drop from various Notorious Monsters throughout the world to upgrade. This page will show you what is required to upgrade each weapon. It should be noted that instead of a weapon skill, both Ochain and Daurdabla reward the player in another manner. For further details, follow the links to their individual pages. 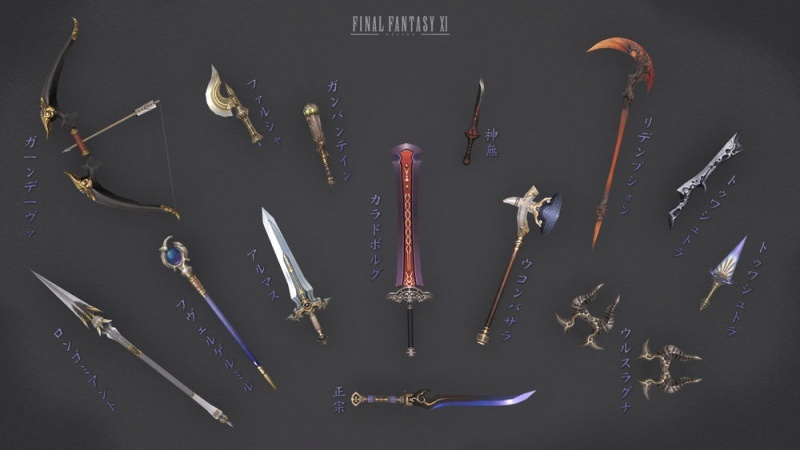 After obtaining your Empyrean Weapon, they can be reforged to their next level variant with AF3 Upgrade Moogle (in Port Jeuno). You may have more than one Empyrean Weapon Trial active at a time. Relic Weapon Trials and Mythic Weapon Trials do not count against this. Reference the above table for what items are required to upgrade to the next level of an Empyrean Weapon Trial. When trading the items to AF3 Upgrade Moogle to advance to the next stage, you must trade the items and the weapon at the same time. You will then receive the upgraded weapon back for you to continue on with the next level of an Empyrean Weapon Trial. When trading the Tanzanite Jewels to AF3 Upgrade Moogle, you must trade the jewels first and the weapon that you are upgrading at the same time. This page was last edited on 13 December 2018, at 20:47.